Below are questions like those I plan to ask on Midterm #2 (March 31). The exam will consist of 4 or 5 questions like these. Below are some code segments. The lines of code are scrambled, and some of the curly braces are removed. Put them back in the right order. *Collect all the sound from our children FIRST,* then collect from my getNext(). Draw the object structures (e.g., boxes and arrows) for the data structures resulting from these methods. We've talked about several data structures in this class: Arrays, matrices, trees, linked lists. Match the data structure to the statement below. A. "Right, so it takes a while to insert or delete in my middle, but you can't possibly get to a specific piece of me faster!" B. "Insert and delete into the middle are really fast with me, but I don't DO complexity – no hierarchy for me!" C. "I'm like my sister that you met early, but she's so one-dimensional, while twice as sophisticated, er, complex!" D. "Organization chart? Sentence diagrams? Verses and chorus in a song? Structure of a scene? I'm your structure!" Questions, comments, answers at Midterm exam 2 review Sp2006: What's My Data Structure? A. A Transcript consists of a set of objects that store a Section of a Course taken and a grade earned. What class are those objects? B. 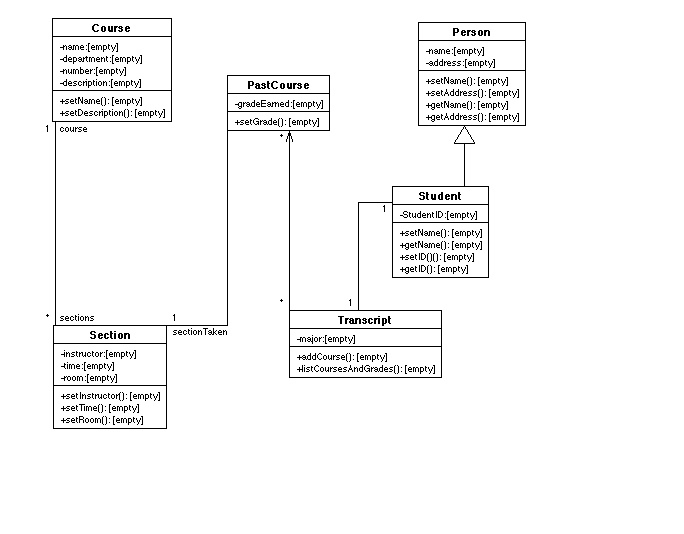 List all of the methods that a Student instance understands, and list all of the data fields that a Student instance contains. C. How many Sections of a Course can exist? D. How many Courses are associated with a given Section? Below is some code that uses PositionedSceneElements to make a scene of a tree, a dog, another tree, and another dog. Write another version that has a dog scaled to 0.25 of its original size, then three houses ("house-blue.jpg"), then three trees, all composed onto the "jungle.jpg" background. A. BorderLayout and FlowLayout are two of what kind of thing? How do they differ? B. What's an Event and what do they have to do with ActionListeners? C. "Casting"? I don't think Java has anything to do with broken legs or fishing, so what is it and when do you need it? A. What's a queue and what do they have to do with simulations? B. What's an example of a discrete event simulation? A continuous simulation?